OMG, I can't believe it's been 2 solid months since our last post...Where has this time gone? Well, to be honest, A LOT has happened to me since that last post. I entered the California State Fair and won 1st place ribbons for 3 baked goods! I entered a gluten-free baking contest at the Fair sponsored by King Arthur Flour and WON 3rd place! I entered a monthly recipe contest through SaveMart and WON! I celebrate my mid-century birthday today! I had to put my babygirl, Natasha, to sleep a month ago. She was a beautiful cat and such a wonderful companion these last 15 years. I had knee surgery to repair a tear the week after she was gone. I'm on the mend thanks to the support of my dad and my friends. So, life really does have its ups and downs. And, through it all, I have had wonderful friends who brought me food, carted me around, took me to lunch, and let me cry. I baked quite a bit, actually...Mostly before surgery. I just never posted anything. Sometimes the mind is too full to blog. I hope you'll all understand. 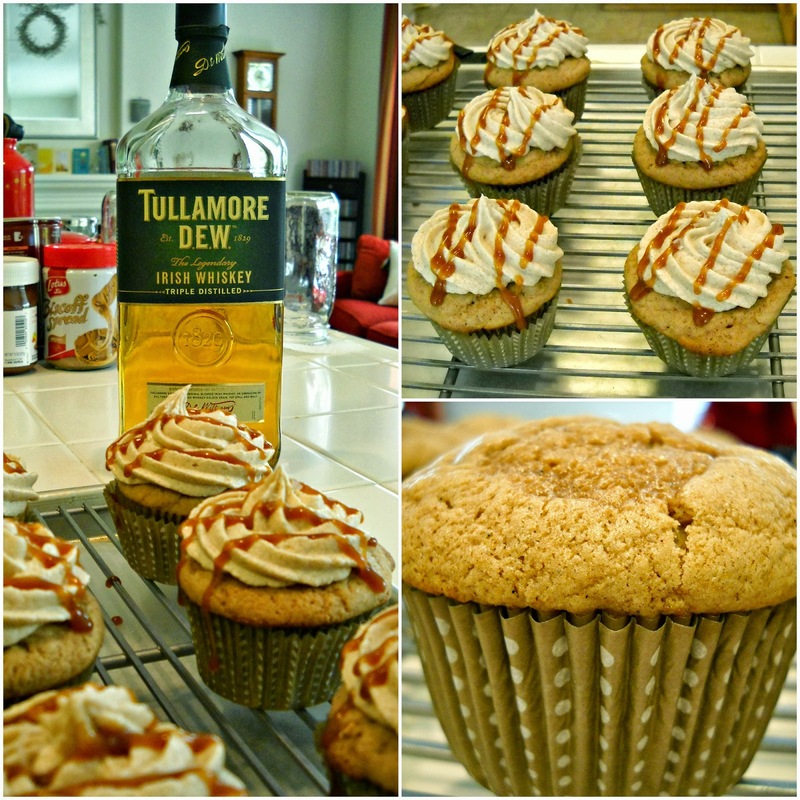 And, what more happy occasion today than this to share our favorite Irish Whiskey with you, Tullamore D.E.W.! 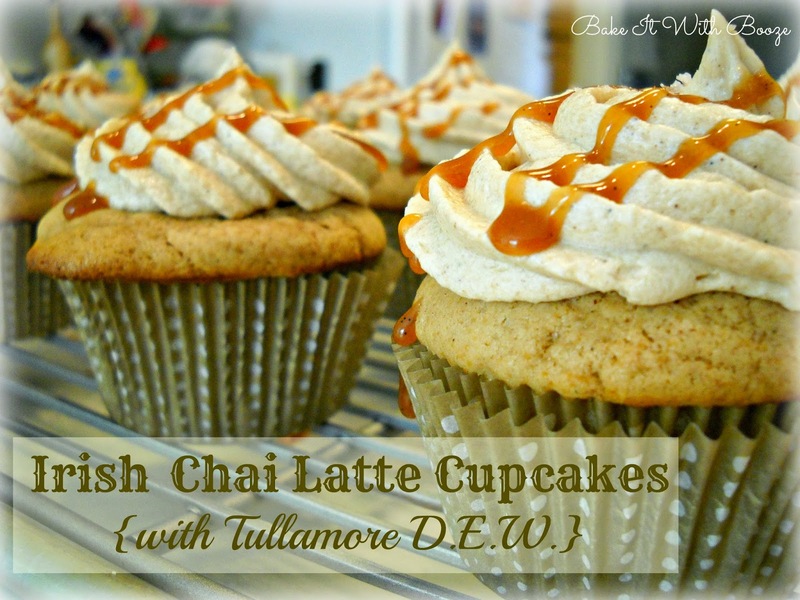 I've had these chai latte cupcakes on my BIWB bucket list for quite some time. I found a whiskey chai latte cocktail so knew the flavor combinations would be spot-on. These did not disappoint! Super moist and full of chai tea latte flavors. I have tweaked the frosting a tad as I found the chai latte mix didn't dissolve into the buttercream. No worries, solution found -- just dissolve it in the liquids. Easy! Thanks of all you for stopping by the blog during our hiatus...We SO appreciate your support!